It’s been a busy, rest-deprived week and there are still miles to go before we sleep. All the more important to look back at three beautiful things from the past week, right? 1. Rudi rubs a sore spot on my back and I doze off for an hour. I awake feeling much refreshed and ready to read. 2. Gramma has been unwell and spent a few days in the hospital earlier this month. It’s good to get home to see that although she’s a bit slower and a tad more frail, she’s relatively okay (for someone approaching 92). 3. The Burrow is chilly in the wee smalls. I pile on wool blankets, add fingerless mitts, plug in the heating pad, make a cup of tea, and, finally, turn on the radiator. Category: three beautiful things. There is/are Comments Off on nap, see for myself, and warmth. It’s not quite as bad as it seems. I’ve started seven of them and one is an audio file on our laptop, which, now that I’m home, I can plug into speakers and listen to while cleaning. And, obviously, whim — and library due dates — will be allowed to play a role as needed. Category: books. There is/are Comments Off on cybils reading for the week. 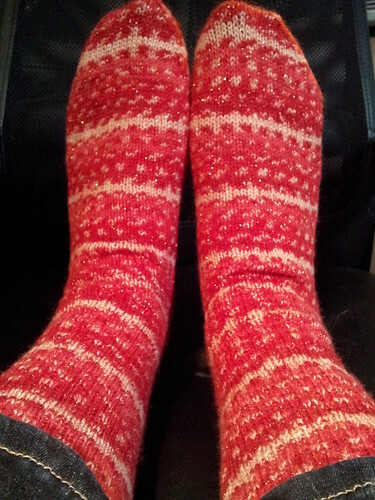 The yarn is Wisdom Yarns Marathon Socks North Pole line in the Candy Cane colorway. Plain stockinette made on 3mm needles. Knit mostly at concerts and baseball games between Summer ’11 and Fall ’12 where the ability to knit in the dark or without paying much attention to my hands was important. In case you can’t tell, they are sparkly, which makes me very happy. It’s probably good to remember there’s an East Asheville equivalent in so many of our shopping avenues, so make sure you hit Politics & Prose or Powell’s before you go to Amazon or Barnes and Noble and your IGA store or farmers market before you head to Stop & Shop or Trader Joe’s. Yes, you’ll probably still have to do some shopping from the big box (or big site) stores, but it doesn’t have to be your first choice. And buying local and independent when it’s an option really does matter to a community: studies suggest that money spent at independent businesses gets reinvested in the community 50-100% percent more often than money spent at large, non-local chain stores. So, a day is a good start. It’s definitely better than not shopping locally at all. But why not make it a predominantly Small Business Season if you’re able? Category: arts,politics. There is/are Comments Off on “east asheville hardware”. While Chloe fulfills her (sometimes nerve-wracking) pre-procedure obligations, she must wrestle with her best friend’s growing doubts about the ethics of abortion, her aunt’s scattered behavior, and the sudden appearance of the boy who broke her heart the previous summer (who just happens to be MJ’s older brother). Set in San Francisco in the waning days of the city’s hippie heyday, the novel covers the changing politics of abortion, drug use, love, and friendship. With a page count that keeps the novel from delving into any subject too deeply, the book still manages to deal with Chloe’s decision in a reasonably satisfying way, although the secondary storylines are wrapped up in a more simplistic, less emotionally resonant way. A decent book, particularly if you were interested in the time period or the history of women’s rights. Category: books. There is/are Comments Off on into the stacks: love & haight. Happy Thanksgiving, everyone! I hope you had a lovely holiday, surrounded by those you love and who love you best. We spent the day with my family up in Connecticut, where we ate a delicious dinner. 1. Susan calls to see if we want to have dinner. We meet them at the playground and walk down to the Greek place from there. Holden decides he wants to hold Rudi’s hand, and baby Caroline curls up quietly in my arms. It’s nice to have friends who are willing to let us borrow their children for a little while. 2. We walk down to the garden to see what we can find. I pull up the tomatillo plant, while Rudi digs up the potato patch. (My second planting failed, but we found a few we’d missed from the first.) The excitement of the afternoon is reserved for the sweet potato patch where we dig up several small specimens. (We also find a few that we think are still growing, which we cover back up.) Digging up food from the earth is surprisingly satisfying. 3. I’m sitting in the Circle reading my book when a young man comes and sits down next to me. He explains he’s a poet and asks if he could recite for me. He does — three poems — and then asks for a donation to help him enter a local slam. I give him a dollar, knowing that even if I’ve been hustled, it was still worthwhile, because, honestly, when was the last time someone read poetry to you?